Perhaps the greatest medieval romance is the fourteenth century English poem, Troilus and Criseyde, by Geoffrey Chaucer. While Homer focused on the impact of passion (both love/lust and rage) on war, Chaucer puts love and loss in the foreground, with a background of war and the unavoidable destruction of Troy. Chaucer also sets the story of Troy into a Christian perspective, by having a Christian narrator relate the poignant, yet pagan, story. The narrator initially is in love with love, but learns through Troilus' tragedy to focus instead on the enduring love of the Christian God. Troilus is a noble Trojan knight who scorns love until he is shot by the God of Love and forced to love a beautiful young widow, Criseyde. She is loveable, but not steadfast, and after she is sent to the Greek camp to reunite with her father, she quickly falls out of love with Troilus and in love with a Greek, Diomede. Broken hearted, Troilus battles furiously against the Greeks until he is killed. After death, Troilus goes to the eighth sphere, not exactly heaven, because he is not a Christian, but far enough away from earth to gain some perspective on the foolishness of human concerns, whether love or war. Chaucer was gentle with Criseyde; later authors were not; Henryson's Testament of Cresseid treats her as a worthless woman who comes to a bad end. Shakespeare's also trashes the lady in his bitter play, Troilus and Cressida. Troilus and Criseyde by Geoffrey Chaucer: Middle English free audiobook includes prose version too. This might be easier to hear in Middle English than to read in that old language. Try it! Boethius: Includes The Consolation of Philosophy: an English Translation, Life of Boethius, Select Bibliography, Metrical Introduction, and Abbreviations. A wonderful sixth century AD dialogue between the imprisoned Boethius and Philosophy, as he attempts to understand the relationship between the stable goodness of God and the painful inconsistency of Fortune. eChaucer: Chaucer in the 21st Century. A great resource site. Includes modern prose translation of entire Troilus and Criseyde. THE LASTE EPISTLE OF CRESEYD TO TROYALUS: this interesting short poem from the late 16th or early 17th c. "was inspired by both Chaucer's Troilus and Criseyde and Henryson's Testament of Cresseid." This site includes a long, interesting introduction and the text of the poem itself is well annotated, which is very helpful to modern readers. Tales from Froissart: Editor Steve Muhlberger remarks that, "For centuries, Froissart's Chronicle has been recognized as the chief expression of the chivalric revival, if revival is the word, of fourteenth-century England and France, and as a key to the aristocratic self-image of the time." The Testament of Cresseid: By Robert Henryson. 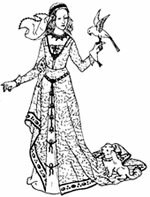 Troilus & Criseyde : links to several different versions of Troilus and Criseyde, including a couple of modernized versions; also links to some historical background information and critical essays on T&C. Troilus and Criseyde by Geoffrey Chaucer: Also includes The Testament of Cresseid by Robert Henryson. Put into modern spelling by Michael Murphy. If you want to read Chaucer's poetry pretty much as he wrote it, yet have problems with the Middle English spelling, this is a good place to start. Unfamiliar words are explained briefly in the margins. I highly recommend this clear, user-friendly e-text. Chaucer Homepage from Luminarium: Includes links to Chaucer e-texts, essays on Chaucer, a life of Chaucer, etc. Chaucer "Metapage": Annotated links to useful Chaucer materials on the www. Essential Chaucer: "The Essential Chaucer is a selective, annotated bibliography of Chaucer studies from 1900-1984.... The bibliography is divided into almost 90 topics, including themes, techniques, and individual works by Chaucer." Harvard Chaucer Home Page: Links to various authors, texts, courses, etc. that are relevant to the study of Chaucer. The Life of Geoffrey Chaucer: A detailed biography from Luminarium (see above). Curry, Walter Clyde. "Destiny in Chaucer's Troilus." PMLA Vol. 45, No. 1 (Mar., 1930), pp. 129-168. Available through the JSTOR database at many libraries. The Catholic Encyclopedia: This is a great place to look up information on all matters medieval. The Chaucer Review: An indexed Bibliography Vols. 1-30. This is a wonderful resource to have online. Use through a subscribing library. Knighthood, Chivalry & Tournaments Resource Library: An interesting collection of materials ranging from essays on chivalry to armor for sale, developed by medieval buffs and members of the Society for Creative Anachronism.